When video snippets of Hillary Clinton being grilled at a congressional hearing about the 2012 militant attack in Benghazi, Libya, appeared on my Facebook and Twitter news feeds, I immediately thought that it was an old story that had resurfaced. But oh no, it was, in fact, new news. The presidential candidate was in the hot seat Thursday during a congressional hearing because House Republicans have nothing better to do with their time than to try to implicate Clinton for her response to the Benghazi attack (Islamic militants killed four Americans in Benghazi, including U.S. Ambassador to Libya Chris Stevens). Clinton was U.S. secretary of state at the time of the attack. Or at least that’s how Democrats have characterized the recent hearing: a witch hunt targeting Clinton. They suspect that the GOP is being plain ole messy, trying to knock Clinton off her presidential-campaign game. Some brilliant soul characterized that sentiment perfectly in a video posted on Vine. 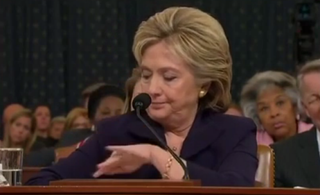 At some moment during the hearing, Clinton brushed something off her shoulder, and that brilliant soul featured that gesture to the tune of Jay Z’s “Dirt Off Your Shoulder,” specifically the part where Jay Z raps “Ladies is pimps too, go and brush your shoulders off.” Check it out below. Genius stuff. There’s the idea that a millennial working in Clinton’s campaign told her to dust off her shoulder during the hearing, knowing that the motion would generate a social media frenzy. She or he was right. Hang in there, Hillary.